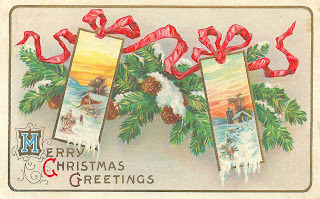 Isn't this a colorful vintage Christmas graphic? This vintage Christmas postcard is so adorable. There's a lot going in the image with the red ribbons, the two small winter scenes, and the lush, snow-covered pine swag in the background. And, I love that the background is gray because it allows the illustration to really stand out. I hope you enjoy!